Fat and Happy Food Blog Tips and Techniques: Use a champagne you want to drink (though it doesn't need to be an expensive one.) If you wouldn't drink it, you won't want to eat it either. Plus there will be at least half a bottle left over and it goes perfectly with chicken. Rub the chicken with one tablespoon of butter - work the butter under and on top of the skin; you may need to break some of the membranes holding the skin to the meat. Push stems of fresh thyme under the skin. Liberally apply seasoning salt and pepper. Cut the carrot, celery stalk, potato, and onion into large, roughly 2-3 inch cubes and place in the bottom of the roasting pan. Squeeze the lemon all over the chicken, place the lemon halves in the breast cavity. Place the chicken breast side down on top of the veggies. Place in the hot oven for 20 minutes. 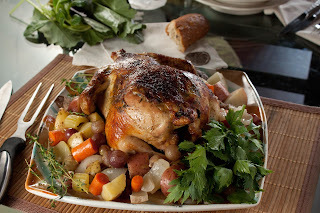 Flip the chicken and pour 1-2 cups of champagne (depending on the room in your pan) over the chicken and add the grapes. 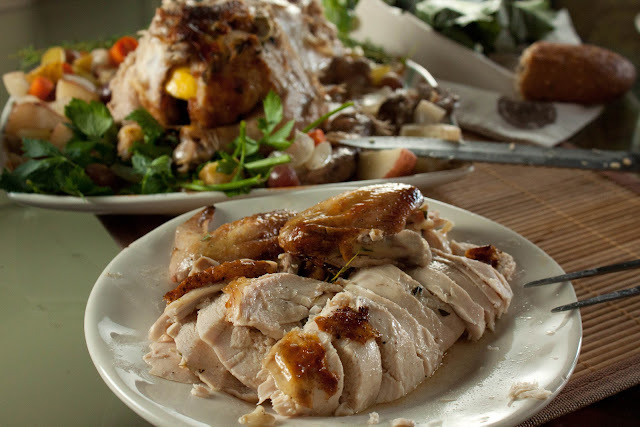 Every 20 minutes, baste the chicken by spooning the champagne juices over the top. The chicken should take about 40-50 minutes to cook from this point. The skin will be crispy and dark, the leg will be really loose, and if you cut the thigh joint the juices will run clear. The internal temperature at the thickest part under the leg should register 160 degrees. Remove from oven, cover with tin foil and LET IT SIT FOR AT LEAST 10 MINUTES to allow the juices to settle. If you cut it immediately, the juices will all run out out on to cutting board rendering the meat dry. While the chicken is resting, remove the vegetables and grapes from the pan, place the pan over medium heat and simmer the juices to reduce slightly. Just before removing from the heat, whisk in the remaining tablespoon of butter. Slice, place on a platter with the roasted veggies and grapes and spoon the lemon champagne gravy juice over the top of the platter. Garnish with fresh thyme sprigs.